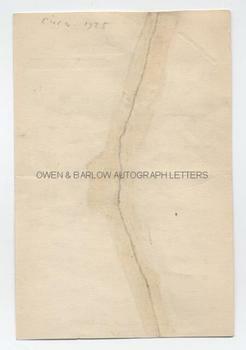 W B YEATS Autograph Letter Signed. William Butler Yeats. Irish poet. ALS. 1p. Savile Club, 69 Brook Street, W.1. July 19th [no year but 1937]. To his wife "My Dear Dobbs". "I have just got enclosed from McCartan and am writing to say that I will return to Dublin and meet him as soon as I have finished with my [. . .?] (July 3rd). Please phone Lennox - the Academy wants to give him the Banquet and phone McCartan himself when he gets to Shelourne. I broadcast here again on August 5th (debate with Dulac). I am [. . .?] and all proofs etc. I shall ask MacMillan for the unbound copy of A Vision and go to Scribners. Yrs W B Yeats. Let me know what Lennox says about Banquet." 8vo. Approx 6 x 4 inches. The letter has been torn vertically and was in two halves but has been professionally and archivally repaired in the past using japanese tissue. All else in very good condition. 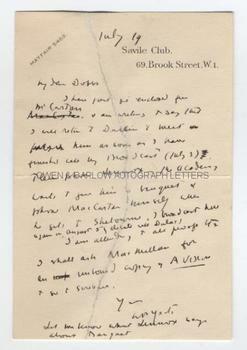 W B Yeats is here writing to his wife, Bertha Georgie Hyde-Lees, who he addressed by a pet name "Dobbs". Patrick McCartan was a Fenian supporter who took part in the 1916 Irish Easter Rising with the Tyrone Volunteers. He was arrested and interned but later returned to Ireland as a Sinn Fein activist and politician. He stood unsuccessfully for the Presidency of Ireland in 1945. Lennox is the Irish poet and dramatist Lennox Robinson who sat on the board of the Abbey Theatre. W B Yeats had completed his book 'A Vision' in 1925, in which he had experimented with automatic writing and the use of occultism. He immediately set about rewriting this and published a revised 2nd edition in 1937. The radio debates with Edmund Dulac which were broadcast live from London by the BBC in 1937 where one of the celebrated incidents in the life of W B Yeats. The two former friends had an acrimonious exchange and brutally insulted each other over differing ideas about art and the setting of Yeats' poetry to music.